Interesting that the newspaper says "hiring an additional 4 firefighters," instead of "bringing back 4 of the 53 positions lost due to the layoffs." Also, there's never a mention that Hillyard, before the layoffs, had 6 firefighters dedicated to its protection, whereas there are now only 3. DAMAGE EXTENT: Total loss on the 26 foot Air Stream trailer. Minimal amount of burn damage to the house and the fence on either side of the trailer. 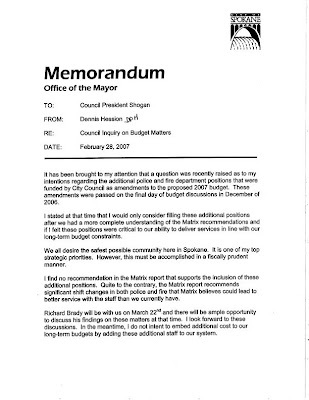 NARRATIVE: On February 24, 2007 at approximately 0825 hours the Spokane Fire Department responded 11 fire apparatus and 31 personnel to a reported structure fire at the Margo Apartments located at 506 W Sinto. Upon arrival fire companies reported heavy smoke and fire issuing from the windows of a second floor apartment. Crews rapidly began search and rescue operations in an attempt to locate any residents unable to escape the structure. Simultaneously crews advanced pre-connected hose lines to the second floor to extinguish the fire in apartment #7. Crews also began to ventilate the hot smoke and gases from the structure to allow firefighters and occupants a safer environment to work in and escape from. The fire was rapidly knocked down and contained to the one apartment. Crews then began to conduct overhaul operations to ensure complete extinguishment of the fire and any hidden hot spots. One occupant of the building was transported to Deaconess Medical Center for evaluation by emergency room staff for injuries received when she attempted to extinguish the fire prior to the arrival of the fire department. No firefighters were injured in the suppression of this fire. PROBABLE CAUSE: The cause has been determined to be incendiary. The suspect is 47 yr old Charles Dawkins. He is described as a white male 6'3 210 lbs. He has sandy blonde hair and a mustache. He was last seen wearing a dark blue Seattle Seahawks Jacket. According to the victim, Charles is armed with a knife and is coming down from a methamphetamine high. He is extremely dangerous. Anyone who knows where he is are urged to call 911. DAMAGE EXTENT: The Red Cross was called to the scene to assist approximately 9 residents of the apartments after the utilities to the building were cut off due to damage from the fire. 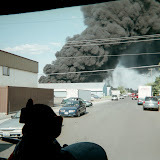 The Spokane Fire Department would like to take this opportunity to remind citizens to rapidly exit any structure on fire and do not attempt to extinguish the flames or re-enter the structure. Leave the building and contact 911 from a neighbor's home or with a cell phone. The fire apartment was heavily damaged by fire with smoke and water damage throughout most of the structure.